I grew up in a mildly SF-fannish household. My dad watched Star Trek every weeknight, and my mom dragged me to see Star Wars four times. I don’t think I read a lot of it as a small child, but when I was thirteen, I picked up Larry Niven and Jerry Pournelle’s Lucifer’s Hammer and Alan Dean Foster’s adaptation of the movie Alien – and that was all she wrote. I devoured classic SF all through high school – Niven’s Ringworld and The Integral Trees, Niven and Pournelle’s Footfall, Pournelle’s Janissaries, Robert Heinlein’s Friday, Spider Robinson’s Callahan’s stories, Isaac Asimov’s robot tales, Foster’s Pip and Flinx novels and his short stories, Ursula LeGuin’s The Left Hand of Darkness and The Word for World Is Forest, Douglas Adams’ Hitchhiker’s Guide to the Galaxy and its more obscure continental-Europe counterpart, Stefano Benni’s Terra! After I went off to college, my tastes shifted – to the Bible, theology and some of the classics of Western literature – but I’d still be occasionally drawn back to science fiction. In my late thirties, I came back full-bore and discovered that SF itself was changing. There was still plenty of “space opera” out there, but whole new fields had developed – the gritty urban fantasies of China Mieville and Neil Gaiman, romances with a scientific twist from Joe Haldeman, post-apocalyptic epics like David Brin’s The Postman, and the cyberpunk of William Gibson and Bruce Sterling. Through Robert Harris’ Fatherland, I found the world of “alternate history” and practitioners like Harry Turtledove. Even juveniles had become more literary, like Charles Sheffield’s Jupiter series and Orson Scott Card’s Ender Wiggin books. My old playground had expanded, built new equipment, and gotten rid of the fences. To this day, most of my fiction reading is SF, and my “to read” list just in that genre alone runs into the hundreds. I’ve often wondered why I’ve been so captivated by science fiction. Yes, I grew up at the right time – the era of Apollo-Soyuz and the Space Shuttle, of Star Wars and Close Encounters of the Third Kind. My mom contributed, but she also read tons of murder mysteries, a field I’ve rarely enjoyed. I do like books that challenge me intellectually, that make my mind stretch. But I think, more than anything else, it’s that science fiction has, inherently within it, a hope for the future. Whether it’s expanding our reach into space, surviving the next disaster, adapting to a new wave of technology or making friends with as-yet-undiscovered races, SF looks forward to better days, to what’s around the next temporal bend. Even though modern times are an improvement over previous ones (one thing I’ve learned from years studying history is that when people maunder about “the good old days,” they’re largely talking crap), I still hope for more and better. And we need that hope – we always have. For my parents growing up, the great threat to them and the planet was totalitarianism; for me, it was nuclear war; for my children, it’s climate change. We need, deep down, to know there’s a future for us, that we can beat these problems and the ones that follow. The Bible and SF dovetail nicely on that point; though they come at it from completely different angles, at the heart of both is the old Pentecostal cliche that “at the end, we win”. And that’s what I was shooting for with the six stories in my new book. Whether it’s a medieval inquisitor trying to unravel the origins of a mysterious visitor or a college student bummed out enough to leave the world behind, a frustrated middle-aged man hamstrung by his past or a girl in captivity worrying about her fate, a captain who’s using technology to reach out across billions of miles or a high-schooler who finds technology reaching into him, they’re all trying to find their way in uncertain (and in some cases dangerous) times. They’re all looking for their futures. And in the process, they discover love and community, surprises and powers, treasures they couldn’t have imagined. Anyway, I hope you buy my book, like it, give it a positive review and cajole all your friends into buying it too. (Baby needs a new pair of shoes. Literally – my kids are 12 and 10, and shoes are expensive!) 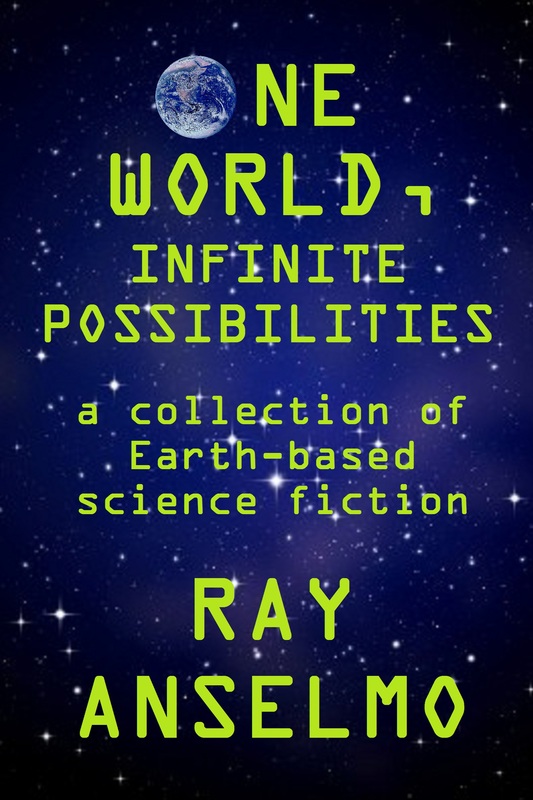 You can check out “One World, Infinite Possibilities” at either Amazon.com or Barnes and Noble.com. The future is bright, and hope is alive. And I’ll try to post again here before my fifth book comes out …. This entry was posted on Sunday, June 29th, 2014 at 7:10 pm and is filed under Christianity, Scribblings. You can follow any responses to this entry through the RSS 2.0 feed. You can leave a response, or trackback from your own site. One Response to My fourth book just hit the (Internet) streets!